Discovered by Nicholas Louis de Lacaille on January 25, 1752. This cluster is another one of Nicholas Louis de Lacaille's discoveries, made during his 1751-1752 journey to South Africa. NGC 3293 consists of more than 50 stars in a 10 arc minutes field, the brightest of which is a red giant of mag 6.5, between many hot, blue bright stars (the hottest of spectral type B0). Rests of some nebulous materials are visible in our image, floating between the stars which have probably formed from them. 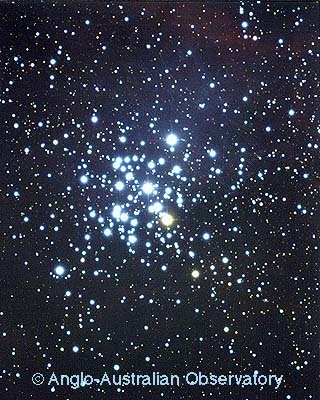 With an estimated age of only 10 million years, NGC 3293 is a very young cluster. Our image was obtained by David Malin with the Anglo-Australian Telescope. This image is copyrighted and may be used for private purpose only. For any other kind of use, including internet mirroring and storing on CD-ROM, please contact the Photo Permissions Department (photo at aaoepp.aao.gov.au) of the Australian Astronomical Observatory.